Mayville Heights Free Public Library was a tad smaller than Boston Public, but Kathleen Paulson had found a home there as their new head librarian. Admittedly, anyone’s home town pulled at the old heartstrings, but surrounded by close friends like Roma Davidson, it was a seriously cozy place to begin again. Maggie Adams was always trying out her matchmaking skills by trying to get Kathleen and Marcus Gordon together. The spark was there and maybe, just maybe someday it would ignite. There were a couple of guys in her life and they were Hercules and Owen. Of course cats weren’t quite on par with Detective Gordon, but darn close. When Kathleen moved to Minnesota, she later would recall it was a fortuitous moment when Herc and Owen followed her home. They literally were magical cats with some very “unique skills.” Owen had an invisibility cloak and Herc could “walk through walls and doors.” They were pretty handy when it came to helping ferret out a few clues to help Kathleen “figure out a killer’s identity.” A large tent was being erected in anticipation of a bit of food tasting and an art show. One other thing the residents of Mayville Heights were anticipating, or dreading depending on which way you want to look at it, was the arrival of hometown-boy-made-good, Mike Glazer. The “gossip grapevine” was working overtime. Mike was a partner in Legacy Tours and the town was hoping he’d open a branch office there. Mags claimed he’d changed and described him as a “festering boil on the backside of life.” The venue didn’t turn Mike on and the feeling was mutual. No one was feeling the love and soon Herc found a little surprise sitting in a plastic lawn chair. Mike Glazer had gone out in style, but later Kathleen recalled that when she went to check his pulse there was “a small bump, a little smaller than an egg” on the back of his head.” Owen later crossed the crime scene tape and dug up a little clue, but was it enough? Kathleen’s arm was being twisted behind her “back at an unnatural angle.” Were her magical cats going to come through for her or would Mike’s killer claim yet another victim? Kathleen and her magical mystery cats are once again using their cat-abilities to solve a murder. Right from the beginning it was easy to see that Mike Glazer would be nothing but trouble. It all started when he had a tiff with Burtis, who just happened to be holding a sledge hammer. The plot moves along nicely and I enjoyed the small-town way that word gets around. Clues pop up from the unlikeliest sources as Owen and Herc dig them up, sometimes literally. Mike was a man “who didn’t know when to shut up,” so there are suspects galore. Things of course, don’t start to gel until the end of the book. 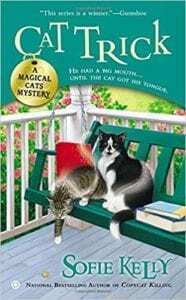 If you like cats, a touch of romance, and a gal who is natural at figuring out whodunit, you’ll love the Magical Cats Mystery series! Quill says: This magical blend of cats, corpses, and a gal who knows how to find out whodunit is definitely the recipe for the perfect cozy mystery!